At age 19, pilot Dale Black miraculously survived an aeroplane crash that killed the other two pilots on board. Hovering between life and death for three days, he had a breathtaking experience of heaven. Against all odds, Capt. Black recovered from his injuries and returned to fly aeroplanes as a professional pilot, pilot instructor, and jet flight examiner. For 40 years he kept the story to himself at the urging of his grandfather to "live" his experience rather than talk about it. 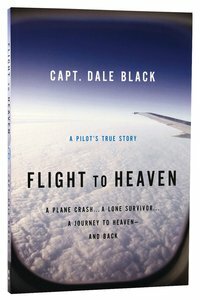 The flight to heaven changed Dale's life, and now he allows it to be told in the hope of encouraging others with this wondrous experience. About "Flight to Heaven: A Plane Crash... a Lone Survivor...A Journey to Heaven - and Back"
Ken Gire is the author of more than 20 books including the bestsellers, The Divine Embrace and Intimate Moments with the Savior. A graduate of Texas Christian University and Dallas Theological Seminary, he lives in Colorado. Customer Reviews For "Flight to Heaven: A Plane Crash... a Lone Survivor...A Journey to Heaven - and Back"
A quick moving, well written and thoughtfully sequenced telling of a personal story. It reminds me there are many different ways the Lord works in people's lives, of courage he gives to deal with tough challenging  situations - although pain is not the focus (a side-effect to telling the story 40 years later but seeing the ongoing impact). The conversation with Joel Green breaks the 'ice' in daring to trust God and follow His prompting. For me the reading has been refreshing and most encouraging. Although somewhat sceptical about peoples accounts of visits to Heaven, I found this book to be encouraging,  uplifting and entertaining. Its narrative style is at times suspenseful. I found it hard to put it down. It is an easy read, despite being a 'reader' of only a few years. However I also know of a well experienced reader (my Pastor who recommended the book.) who found the book to be a worthwhile read. If I had to choose whether this is a true account, I would choose true. Regardless, it left me uplifted and encouraged to push on in my Christian faith.